This email is the first in a series that I’ll send to help you maximize your wedding day experience. I’ve seen a lot of weddings over the years, and I want to do everything I can to help you have a meaningful schedule, get fantastic pictures, and maybe even enjoy a little downtime along the way! Let’s start out by talking about different elements of your wedding day. I’ll send an email in a few days that brings all these pieces together in a full-day schedule, but for now I want to write about the different parts that will come together into something special. I love these pictures! You and your closest friends prepare together, and your pictures help you relive all the laughs and smiles as you anticipated your day. This is a great, low-pressure way to warm up in front of the camera - no posing required! And you’ll love the special memories you made with your close friends before the day kicks in to full-gear. After your hair, makeup, and dress are ready, we can take a few minutes to record images as you set out to meet your man. Often all we need is a window to provide beautiful soft light, and you’ll have timeless images to enjoy for a lifetime. Not to be outdone, we want pictures of the groom looking his best as well! Often my second shooter will capture these images, or I can also do them before the ceremony if that works better. This is optional, but it’s a powerful and meaningful time for couples who choose to write to each other. When you share your heart in writing, you set the tone for your day, and you make clear to each other the significance of the promises you’re making. Ok, I know this can be controversial, but hear me out: a first look might be the best photographic decision you make about your wedding day! 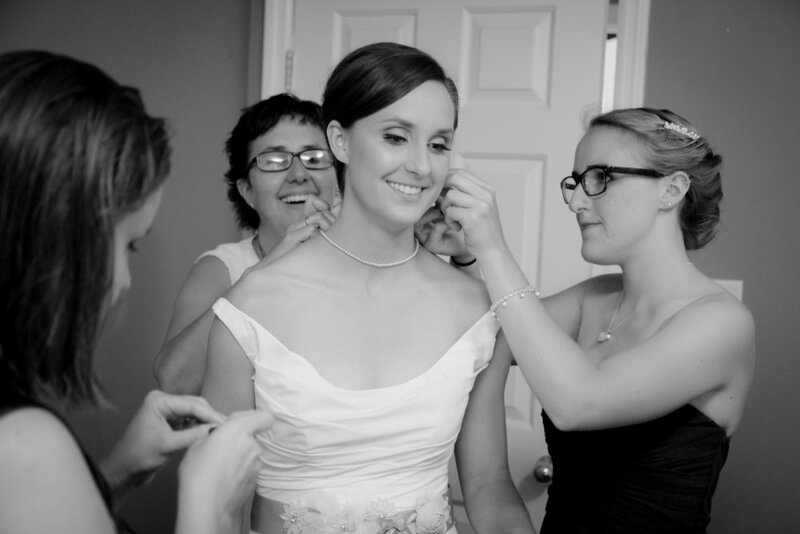 A beautiful story - First look images are often some of the most powerful from your whole day. You have suspense, surprise, and delight all in one beautiful sequence of images. It adds to your album, and often these images are ones you want to feature in wall art. More efficient schedule - It will save you a ton of time if you get most of your couple’s portraits done before the ceremony. 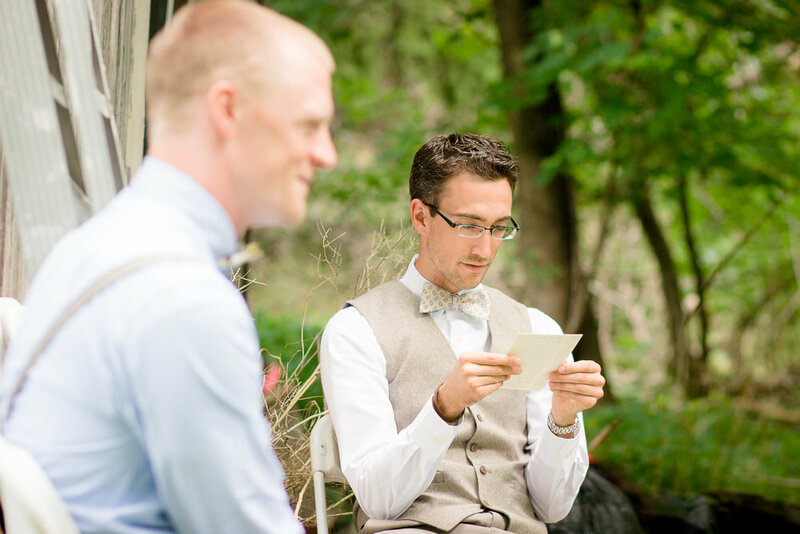 Do you want to minimize your guests’ time waiting between ceremony and reception? A first look is the best way to accomplish that. Special memories together - When my wife and I got married, one of our favorite times ended up being our first look. I didn’t anticipate this, but we’re not into big groups of people, and we’re so glad we got to enjoy seeing each other in private before our ceremony started. Pictures before the “wear and tear” of the day - The honest truth is that, as the day goes on, hair gets a little out of place, and makeup isn’t quite what it was in the morning. Get some pictures together before this happens! This is it! You get to pledge your love to each other, and you’ll get a ton of great pictures of your favorite moments. Most couples choose to do family pictures either before the ceremony starts, if they did a first look, or right after the ceremony finishes. The key is to move relatively fast so we have plenty of time for your couple’s session. After pictures with family and your party, we’ll get away for another round of pictures now that you’re officially married! This adds another set of images in a location different from your first look, which increases your memories together and your opportunity for striking pictures. This is often where couples put the most work into details: table cards, centerpieces, cake table, uplighting, and more. There are also great opportunities for pictures when you enter the room, during toasts, enjoying first dances, and all evening long on the dance floor. Usually during dinner there’s a lull while the guests are being served, which gives us a chance to duck out and grab some romantic sunset images. I love a big send-off! 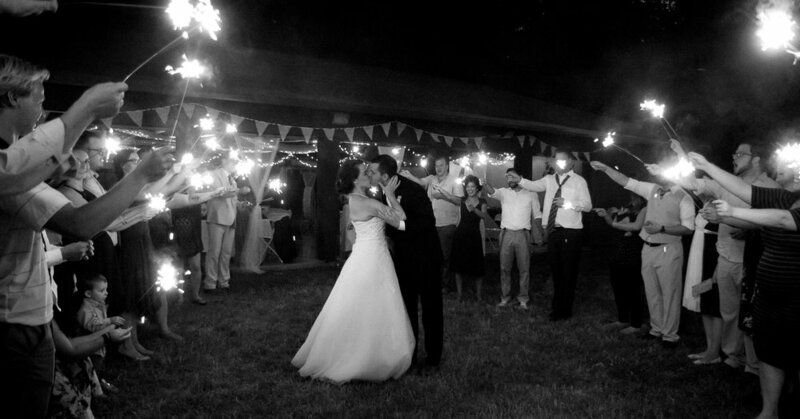 Couples will often line the outdoor walkway with guests holding sparklers. It’s tons of fun, makes for memorable pictures, and it’s a great way to accommodate a venue’s closing time without simply turning off the music and lights. Of course, my assistant and I will capture beautiful memories outside of these times, but these are the big ones for you to consider when building your schedule. I’d love to talk as you work on your schedule. I’m happy to be a resource, and I value being in the loop so I know what to expect during every part of your wedding day.